Nico Rosberg has won the 2015 Austrian Grand Prix at the Red Bull Ring after beating his team-mate and pole-sitter Lewis Hamilton. Rosberg took the lead after a great start before snatching the lead from Hamilton into turn 1. Any hopes for a comeback for Hamilton were dashed when he earned a 5 second penalty for crossing the pit exit line. Felipe Massa took his 40th career podium after capitalizing on a slow pit-stop for Ferrari’s Sebastian Vettel. Dry conditions greeted the drivers for the second running of the Austrian Grand Prix since its return last year. After rain spiced up qualifying yesterday, Lewis Hamilton and Nico Rosberg locked-out the front row of the grid despite both spinning in the final session. It wasn’t Hamilton who had the advantage off of the start, with Rosberg drawing alongside to take the lead into turn 1. Hamilton tried to use to slipstream of Rosberg on the run to turn 2 but he couldn’t get by on the out-side. He tried once again to get a run into turn 3, with that proving unsuccessful again. Further back, Kimi Raikkonen had to gain positions as quickly as possible having qualified disappointingly low yesterday. He appeared to get a tap from Fernando Alonso out of turn 2 which then saw him lose control and collect the McLaren driver and pin him against the outside barriers. The contact then threw Alonso over the top of Raikkonen, with the car narrowly avoiding Kimi’s head. 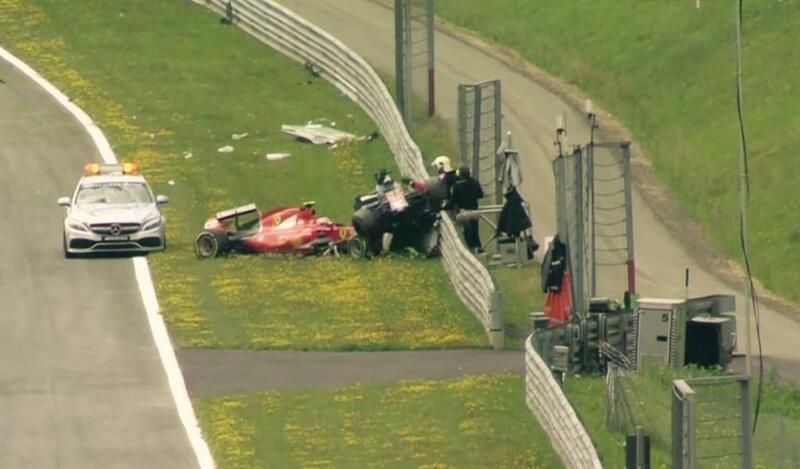 Both drivers were okay, but naturally the safety car was deployed. The race got back under-way at the end of lap 6, with Rosberg getting a reasonable get-away to stretch a lead of just about a second over his team-mate. Rosberg soon elevated his lead to over 2 seconds with a string of fastest laps for the #6 Mercedes driver. The first pit-stops began around the lap 25 mark, with Grosjean and Hulkenberg pitting in short succession. Hulkenberg had just lost out to Valtteri Bottas, who had been one of the only drivers to have overtaken anybody having pulled off a good move on Verstappen earlier on. Bottas soon came in, but Force India managed to service Hulkenberg quick enough to get him back out ahead of the Williams driver. Grosjean was also battling after a great side-by-side moment with Felipe Nasr in the middle sector. Mercedes called race leader Nico Rosberg in at the end of lap 33, with the German locking up no less than twice on his in-lap with under-steer starting to also set in. Lewis Hamilton closed in by 7 tenths on Rosberg’s in-lap, with Mercedes choosing to keep Hamilton out for an extra lap to try and open up the chance for an under-cut. This wouldn’t happen for Lewis however, with Rosberg putting in the fastest lap of the race on his first flying lap to maintain a lead of almost 2 seconds. Rosberg soon opened up the lead even further to over 5 seconds, with Hamilton’s misery soon being amplified by a 5 second penalty for crossing the pit exit line which would be added to his race finish time. He was far enough ahead of 3rd place for it to not be an issue, but it would mean that should he manage to catch Rosberg, he’d have to pull out a 5 second lead to keep the win. Sebastian Vettel briefly took the lead of the race having been the last of the front-runners to make his pit-stop. He was too far behind to think about jumping either Mercedes, but he was also met with a slow pit-stop as the right-rear tyre struggled to go on the car. He re-joined behind Felipe Massa and would have to catch him for 3rd place. Daniel Ricciardo still hadn’t pitted by lap 50 out of 71 and was lying in 8th place having started in 19th for Red Bull. He was holding off Pastor Maldonado as best he could, but the difference between Mercedes and Renault power was highlighted as Pastor cruised around the Australian on the run to turn 2. Red Bull then called Ricciardo in at the end of the lap with the team getting him back out ahead of team-mate Kvyat in 11th after serving his pre-race 5 second penalty on top of his pit-stop. The battle for the final spot on the podium was beginning to close in, with Sebastian Vettel starting to reel in Felipe Massa in the Williams. With just under 10 laps to go, Vettel was within a second of Massa. 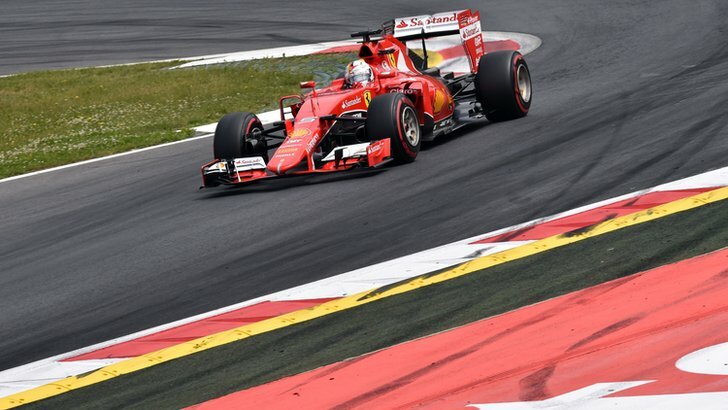 with 5 laps, it was 5 tenths; with Vettel inching ever closer to getting a podium in the closest he has to a home race this year after the absence of the German Grand Prix. This determination was shown when the pair lapped the Manor of Roberto Merhi, with Vettel putting all his trust in the Spaniard in the final turn with a decisive move on the inside. Vettel had his first look at taking the place into turn 3, but Massa was too far ahead to be successfully lunged at. 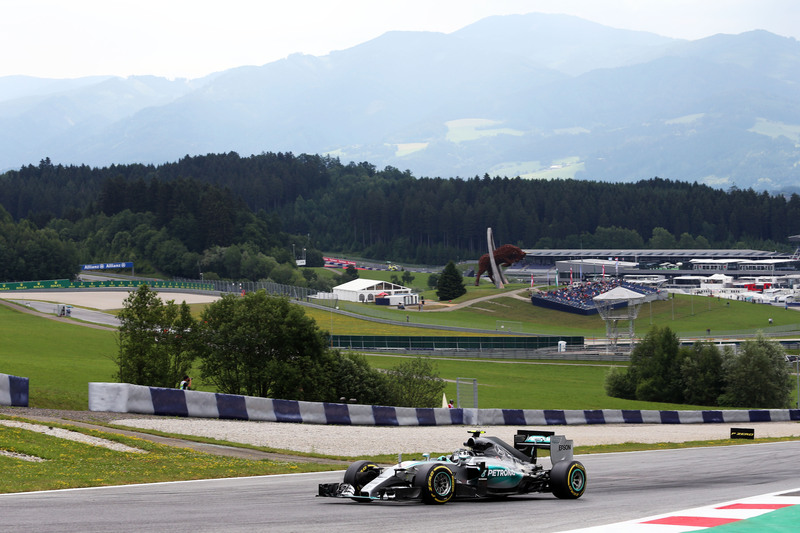 Back up at the front, Nico Rosberg was on course to take his second consecutive win in the Austrian Grand Prix having won on it’s return last year. There was no threat from behind thanks to Lewis Hamilton’s 5 second penalty, but there was a slight concern due to a vibration on his front left wheel. Anxiety was rife in his voice as he requested his team put all eyes on the vibration should disaster strike. Thankfully for Nico, the car held itself together for the final few corners to take his 3rd win of the year; reducing Hamilton’s lead in the championship to just 10 points, with the British driver taking 2nd place heading into his home race at Silverstone. Felipe Massa just about managed to hold off Sebastian Vettel to take his first podium of the year and the 40th of his career. The gap was very close, with Massa and Vettel separated by just a few tenths at the checkered flag. Massa’s team-mate Valtteri Bottas took 6th place, highlighting a strong race for the Williams team. Nico Hulkenberg took his best finish of the year in 6th place for Force India; a great result considering their faster B-spec car isn’t due until the next round at Silverstone. He finished ahead of the Lotus of Pastor Maldonado, who despite having almost crashed his car in the closing stages after turning too quickly with his DRS open took 7th place. Max Verstappen lost his late race duel with Maldonado to take 8th place after his tyres rapidly degraded in the closing laps. Sergio Perez made it a double points finish for Force India, with Daniel Ricciardo putting in a decent drive to take the final points paying position in 10th having started 18th. 6 drivers retired from the race, with 4 falling by the wayside within the first 10 laps. Kimi Raikkonen and Fernando Alonso retired in lap 1 after their crash, with Will Stevens parking his car after an oil problem during the safety car period that followed. Jenson Button soon capped off one of the worst ever weekends for McLaren in their history after his team ordered him to park the car on lap 8. Later on, Roberto Merhi would join his team-mate in Manor’s first double retirement of the season; which isn’t too bad considering the lateness of their entry this year. Carlos Sainz and Romain Grosjean were the last too retirees, with both falling foul of mechanical issues.